Bonn, 8 April 2019 How can we realise good and healthy living conditions for everyone around the world when global climate change challenges today’s economies and life styles? How can we preserve our planet’s resources for future generations? How can research contribute to more sustainability? 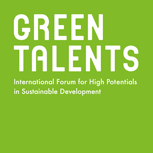 These questions are at the centre of the “Green Talents – International Forum for High Potentials in Sustainable Development”. It invites you as a creative and open-minded scientist to apply with your project to showcase your research to a broader public, to discuss with renowned experts, and to conduct your research in Germany. Eligible to apply are master students, PhD students, postdocs, as well as young professionals, with no more than three years of professional work experience (excluding professional work experiences gained within the scope of an educational degree) and a strong focus on sustainable development. Applicants must prove excellent command of English and above-average grade. Further, only applications from non-German citizens or residents can be considered.